The little kid in me jumped up and down when I learned there was a restaurant using a miniature train to deliver orders. It sounded like just the ticket for an entertaining dining adventure, so I scheduled a stop at Fritz’s Railroad Restaurant in Kansas City. The menu suggested I “choo-choose” Fritz’s favorite, a hamburger topped with hash browns, grilled onions and melted cheese called the Gen Dare. Since I grew up on meat and potatoes, the texture and flavor of this combination in a sandwich sounded intriguing. I phoned in my order from my orange booth and watched in awe as the miniature engine chugged down the overhead track from the kitchen to my stop, where the food was released and lowered to the table by a hydraulic lift. 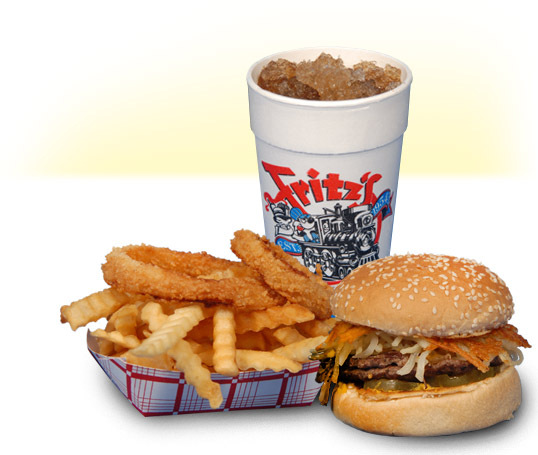 One taste and I knew Fritz’s had been cooking burgers perfectly for decades. Owner Fred Kropf’s family has been in the restaurant business since the 1920s. His father, Fritz, engineered what he called the Skat Kat food delivery system, installing it in the 1970s. Patrons simply referred to it as a train and began bringing in railroad memorabilia, such as lanterns and toy engines, that quickly spread throughout the restaurant like the railroad stretched across Kansas in the 1800s.When I told my son about Fritz’s, it was full steam ahead for a tenderloin sandwich at the more modern Shawnee location. He agreed it’s no wonder Fritz’s has been voted the number-one most kid-friendly restaurant in Kansas City – even us big kids enjoy the ride!